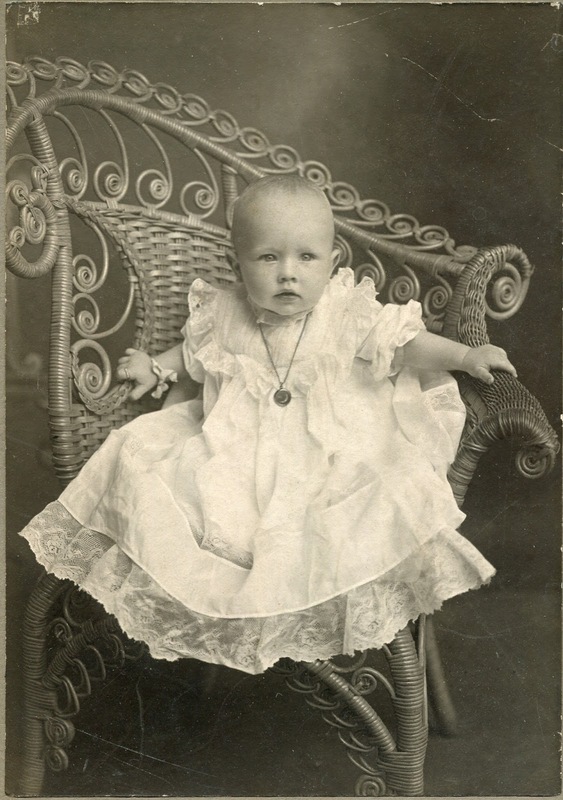 My paternal grandmother, Dagmar Alice Viola Anderson, was born on this day in 1905 in South Manchester, CT to Carl Johan Anderson and Mathilda Alfina Johnson. She was their third child and only girl. 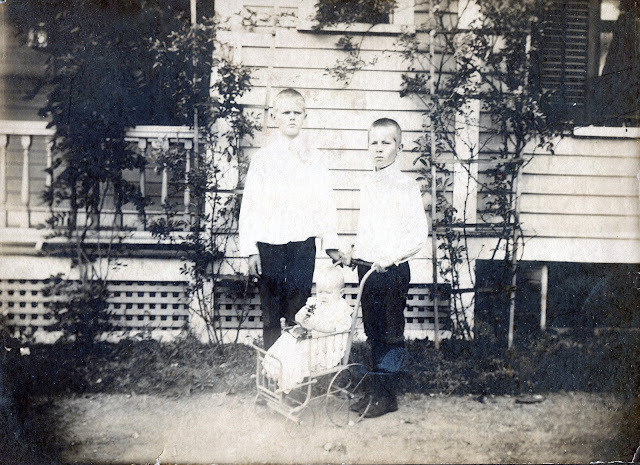 Dagmar's brothers, Axel Heinrich Valdemar and Elmer Carl Ragnar, were born when the family lived in a house which they rented from their father's employer, as many of their workers did. By the time Dagmar was born, her parents had saved money to buy a parcel of land from Cheney Brothers and borrowed money from the bank to build their own multi-family home, with the family living on one side and boarders on the other. 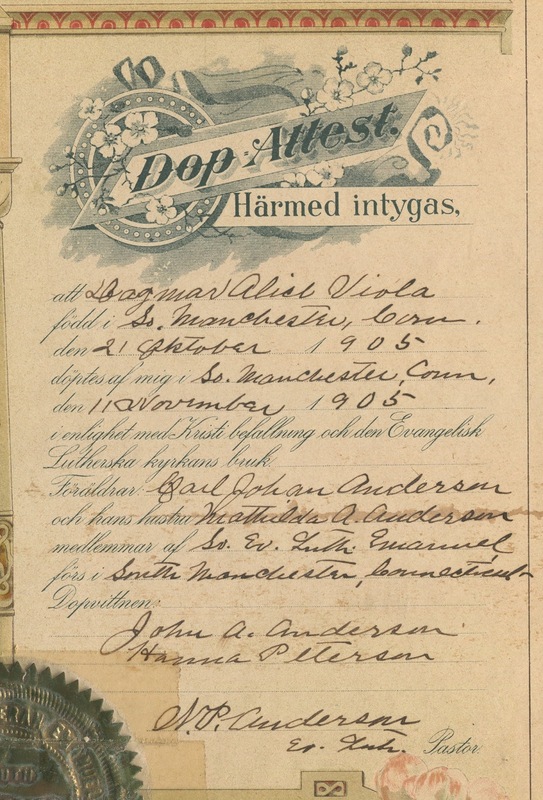 On November 11th, 1905, Dagmar was baptized at Swedish Evangelical Lutheran Emmanuel Church. Her baptismal certificate, beautiful but in horrible condition, was among the treasures we found in the "basement stash" last September. Soon I plan to see if a digital photo restorer can digitally stitch my scans of all the pieces together and recreate the missing sections to create a reproduction. Then I'll need to invest in an archival storage solution for the original. What beautiful photos and baptismal certificate! I'm sure it can be digitally restored & wish I had those skills. It's one of those things I hope to learn still! What a beautiful dress and jewelry for a special occasion. Thanks. I wish I did, too, but I don't think Photoshop is something I'm going to master. I hope you do, though! Thank you. If any of it survived, I don't know what became of it.